It's one of the world's worst kept secrets that the Caribbean holds the crown for blissful beaches. Sparkling seaside hotspots and off-the-beaten-track beauties are as unique and varied as the islands you'll find them on. Powder-sands sit beneath volcanic peaks while party hotspots spice up your night with a healthy dose of soulful rhythms. Framed by lush jungles and dramatic cliffs, set up residence on your towel and plant yourself under the sizzling sun and swaying palms. Barefoot in the sand is a given when you're exploring the best Caribbean beaches. Welcome to the island that has a beach for every day of the year! It's pretty much a given that you'll find the perfect spot in the endless stretches of sand. 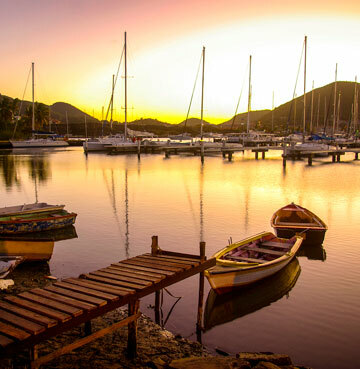 Whether you're after tranquillity on the Caribbean coast, wild waves on the Atlantic side or a mix of both – you won't be disappointed with amazing Antigua. Dickenson Bay is a mile or so of west-facing sand, boasting sports and beach bars plus plenty of eateries to tantalise your taste buds. The bay extends down to the south (Runaway Bay), where you can escape the crowds and get some towel time to yourself! Half Moon Bay is often hailed as the most beautiful beach on the island. Nestled against the southeastern shore, this reef enclosed, palm-fringed beauty is the very definition of a tropical paradise. This is the place to kick-back, relax and lap up the laid-back lifestyle. If you're looking to get to know the local residents that live below the waterline, head up the coast to Green Island and indulge in a spot of snorkelling. Accessible only by boat, this luscious little landscape is home to one of the quietest beaches in Antigua and great to get away from it all. The wild and rugged natural beauty of Jamaica is jaw-dropping. A huge mix of long sandy stretches, hidden coves and secret bays await beach lovers. If quintessential Caribbean is your style, then Doctor's Cave Beach in Montego Bay is a must. One of the most famous beaches on the island, the coastline cradles pristine white sands. Hailed as the 'Hip Strip', you'll find an abundance of music and food – so grab yourself some Jerk chicken and enjoy those Jamaican rhythms! 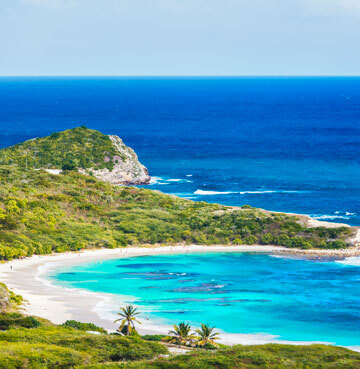 Further west you'll find one of the best beaches of the entire Caribbean. Seven stunning miles of soft white sands and uninterrupted ocean views make up blissful Negril Beach. Sitting pretty on the far western tip of the island, this laid-back beach town is the perfect place to relax and put your feet up. The sand shelves gently into the calm, brilliant blue sea which makes it ideal for swimming or just dipping your toes in. Thanks to Negril's privileged position on the west coast, you'll be hard pushed to find a nicer spot to watch the sunset. Enjoy live reggae music as the golden ball sets into the horizon, or better yet, take a ride on a floating tiki bar. Watch the reds and oranges stretch across the sky while sipping on fruity cocktails and rum punch. Holiday bliss! 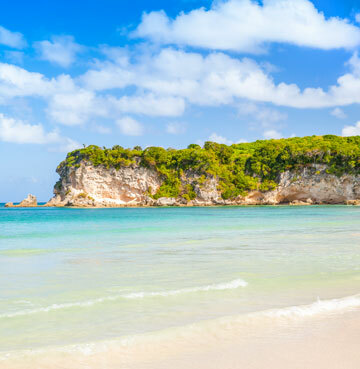 Boasting over 800 miles of coastline, you might think finding the perfect beach in the Dominican Republic is like finding a needle in a haystack. The truth is – you'd be hard pushed to find a bad beach! 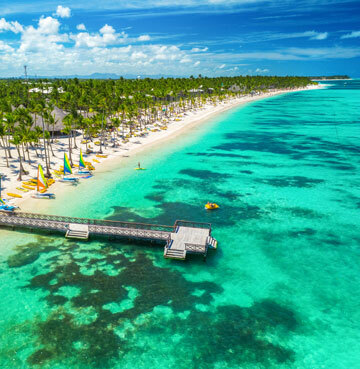 Whittling it down is no easy task, but the picturesque Punta Cana comes out trumps with its first-class facilities, secluded shorelines and bustling party beaches. There's something for every kind of beach lover here thanks to the 50 miles of coastline that runs from Bavaro to Uvero Alto. The area is actually made up of eight blissful beauties, with many flying the famous Blue Flag. Dubbed 'the coconut coast', the tropical paradise is lined by luscious swaying palms and coconut trees galore – which is great if you're on the hunt for a shady spot when the sun is sizzling. A huge host of wet and wild watersports are available for adrenaline junkies, from jet skiing to deep-sea diving – the list is endless! Macao Beach is the best for a spot of surfing if sitting still doesn't float your boat. UNESCO have also listed it as one of the best beaches in the entire Caribbean thanks to its clear waters, natural scenery and secluded nature. Picturesque Playa Rincón, found on the Samana Peninsula, is made up of 5km of pristine, undeveloped sands. Set to a backdrop of thick palm forest and peppered with coconut trees, these secluded shores are tropical paradise at its best. It takes a bit more effort to reach – either via a bumpy road best tackled by a 4x4 or a small boat – but your determination will be rewarded with virtually deserted sands, calm waters and the unbeatable feeling of having the place to yourself. The stunning landscapes of St. Lucia are less about bays and beaches and more about jaw-dropping natural beauty and dramatic scenery. Never fear though – there's still some gorgeous spots to lay out your towel. One of the most popular beaches among visitors are the wide white sands of Reduit Bay, found in the famous Rodney Bay area. Buzzing with bars, high-class restaurants, shops and nightlife – including the unmissable Friday night street party at Gros Islet. The calm Caribbean Sea is ideal for a leisurely swim, plus you can try your hand at every kind of watersport imaginable thanks to the second-to-none facilities on offer! The island's south west corner is harder to navigate than the well-known north, but you'd be missing a trick if you didn't see the sweet sights of Soufrière and its surroundings. Anse Chastanet is concealed at the bottom of steep forested hills and is one of the most tranquil areas on St. Lucia. The journey may be a little hair-raising, but the views across the sparkling sea to the picture-perfect Pitons before you make the descent to the beach are sure to take your breath away. Once you reach the beach you'll be greeted by 150m of dark, silvery sands that are dotted with palms and sunloungers. There's also a coastal walkway that takes you to nearby Anse Mamin. The beach is just the beginning here, the real treasure is under the waves. Discover the wonder of one of St. Lucia's best snorkelling sites and share your swim with Parrot Fish, Trumpet Fish, Needle Fish and many more. Rainbow coloured coral makes a beautiful backdrop for an abundance of marine life. Further along the coast, Sugar Beach sits between the two dramatic Pitons. Sunbathing and snorkelling between the iconic pair is life at its sweetest! 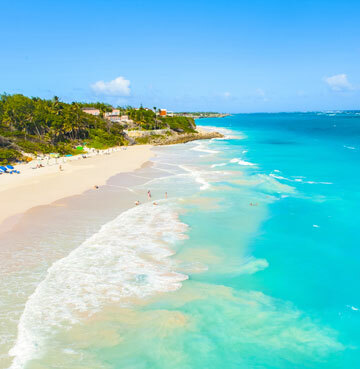 Bajan beaches are among some of the most revered in the world, so you're sure to find a sandy stretch of paradise that fits your beach bucket list. Crane Beach sits in the south and is arguably one of the most jaw-dropping beaches in the entire Caribbean! Quite a statement, but once you lay eyes on pink-tinged sands, azure waters, craggy cliffs and luscious forest it all begins to make sense. The Crane Resort is nestled nearby and offers breathtaking views over the beach. Whether you want to laze the day away on secluded sands or ride the waves and try your hand at surfing, there's plenty of fun to go around. The platinum coast on Barbados' west side is home to picture-perfect Paynes Bay. An easy-to-access beach fringed by palms, the prestigious Sandy Lane Estate can be found nearby. A 20 minute walk from end to end, Paynes gives you plenty of space to spread out and find a quiet spot. Swimming here is some of the best on the island, thanks to warm, calm waters and no currents. Shallow reefs sit just off the shore and are home to friendly sea turtles, who will even let you touch their shells! Home to a healthy population of hawksbill and leatherback turtles, you'll find them hanging out, feeding and playing in most inshore reefs. Wondering what there is to do in the Caribbean? There's a lot more than beaches, that's for sure!